Online poker had what might have appeared to be a quiet legislative year in 2014. Across the United States, multiple state level battles were talked about, but didn’t see much action. At the federal level, there was far more noise, but again, little in the way of actual results. Still, some of what happened this year could set the stage for battles next year and even beyond. After watching Nevada, New Jersey and Delaware start their online poker markets in 2013, there was plenty of optimism for what might come in 2014. Would California finally get around to passing either poker or full online gambling legislation? Would any other states, perhaps Pennsylvania, move to add online poker to their gambling expansion plans? For fans of Internet poker, the answer to both questions was an unfortunate no. While there were rumors of various states showing interest in online gambling, most states including Pennsylvania, took a wait and see approach. That decision does make some sense: with three states now running various forms of online gambling, there are essentially three lab experiments that can be mined for data and used as examples for future states to learn from. The one state that really did look like it might pass online poker laws in 2014 was California. As always, there was the major issue of the state having numerous gambling interests, not all of which saw online poker in the same way. Some of the card rooms and Indian tribes in the state wanted a bad actor clause to keep PokerStars out, while others (including the Commerce Club, the Bicycle Casino, the Hawaiian Gardens Casino and the Morongo Band of Mission Indians) formed a coalition with PokerStars to fight against such a rule. Nearly all of these groups wanted the horse racing industry kept out of the online poker game, something the tracks threatened to fight against by working to block any bill they weren’t a part of. The end result of all of this maneuvering was that the clock eventually ran out on any efforts to regulate online poker in California. Lawmakers have pledged to once again look at the issue in 2015, but the retirement of State Senator Lou Correa and the indictment of Assemblyman Roderick Wright have removed two of the strongest advocates for Internet gambling in the state legislature, making many analysts pessimistic about its future prospects in California. While nobody came close to voting on the issue of online poker in Congress this year, there was certainly movement on the issue, and not in a direction that pleased poker players. 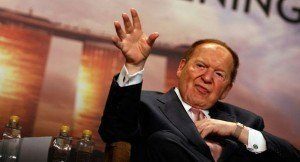 Las Vegas Sands CEO and Chairman Sheldon Adelson pushed for a bill known as the Restoration of America’s Wire Act (RAWA), and found willing sponsors for the bill in each house. That bill was introduced in the Senate by Senator Lindsey Graham (R-SC) and in the House of Representatives by Representative Jason Chaffetz (R-Utah) in late March. RAWA would edit the existing Wire Act to clearly ban online poker and casino games (the current interpretation of that law is that it only pertains to sports betting). RAWA was never likely to gain traction in 2014, but it did pick up bipartisan lists of co-sponsors in both houses. Prospects for RAWA may improve in 2015. With the new Republican majority in the Senate, there may be an increase in the likelihood that an online poker ban could get a real look, especially amongst GOP members who feel like they may owe Adelson for his support. However, many Republicans oppose such a ban citing the issue of states’ rights, and while it might be possible to pick up Democratic votes to replace them, party leadership may not even want to broach a low-profile issue that has the potential to cause battle lines to be drawn within the GOP.